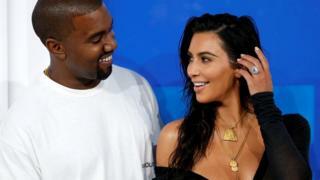 Kim Kardashian says Kanye West is "being himself" and hit back at claims he's experiencing mental health issues. The 37-year-old jumped to her husband's defence after he was criticised for pro-Trump messages including calling the US president his "brother". "To the media trying to demonize my husband let me just say this," she tweeted. "Your commentary on Kanye being erratic and his tweets being disturbing is actually scary." In a flurry of messages, Kanye updated fans on new music, his clothing line and shared his appreciation for the US leader. The rapper's comments didn't go down well with some fans. Some people and media outlets appeared to question Kanye's mental state. In 2016, the rapper was taken to hospital following a "disturbance call" and there were reports he was admitted for a "psychiatric evaluation". However Kim said people shouldn't be concerned with the rapper's state of mind. Fellow rapper and close friend Chance the Rapper also jumped to Kanye defence. Kanye also pointed out not everyone's views have to be the same. It's the second time in a week that tweets from Kanye have sparked an online debate. The 40-year-old only recently returned from a social media break.